We created a ripple of love and peace and knowledge and sing and dance and much more on January 5th, 2018, we planted the seeds of oneness and started a journey of "Building Bridges" between us. The "Building Bridges" event at De Wolkenfabriek with special guest speakers from Syria, Jordan and the Netherlands who will fill an interactive program for all those interested, combined with delicious Syrian food and snacks served by Yamen cuisine, as well as Arabic songs and Dabke that made us all laugh and dance and bond. Aghyad Al-Sherfawi from Syria shared his story with us taking us through all the stages he went though on his way in an inspiring passionate , Bayan Bayan M. W. Quteishat made a presentation about the hero's journey and took us to those who live in limbo "The land of the unheard and the unseen" Bassem A. Dalloul joined Bayan in the presentation and together they had everyone sing "Kncocking on Heaven's Door", Super great food was offered with love by Yamen Ericksousi, Syrian, Iraqi, Lebanese songs and music made everyone dance and sing later, and it was all managed and orchestrated by the inspirational Jette Haan and hosted by the fabulous Wolkenfabriek. We thank everyone who came and participated in this event and promise you more events in the coming future. An initiative to bridge the gaps and ensure inter-cultural communication and synergy through for a better and brighter world. It aims at taking all the challenges that the refugee crisis revealed to become golden opportunities for inclusion, diversity and oneness. Through art, workshops, knowledge and several other tools “Building Bridges” aims at creating impactful events that increase partnerships and higher awareness in a practical and tangible way. 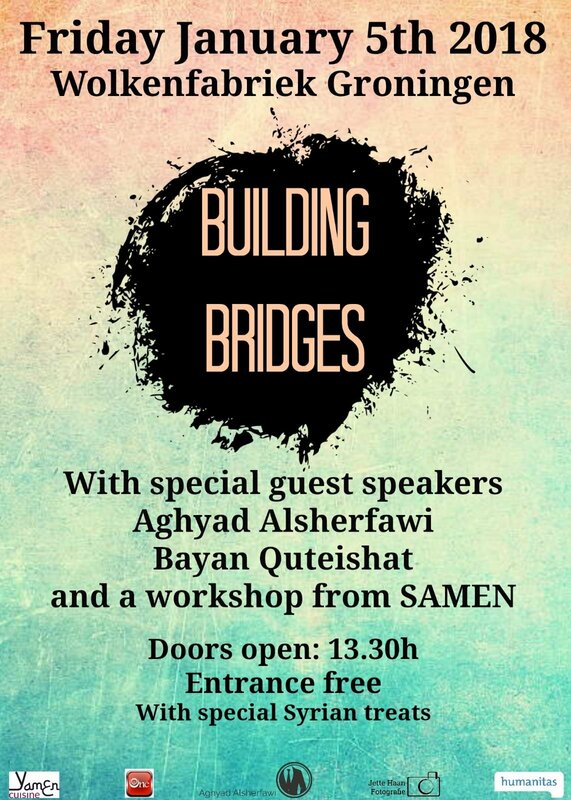 “Building Bridges” is an initiative by a diverse group of passionate people who strongly believe in social justice, freedom and human rights.